New Delhi: We've heard about that 8-year-old who drove his sister to McDonald's and the 12-year-old who attempted an epic road trip across Australia, but these twins really take the cake. All of two-years-old, Aaron and Evan were recently pulled over by police officers in New York City. Their crime? Driving "over the cute limit." Or so their doting dad Alex tells InsideEdition.com. 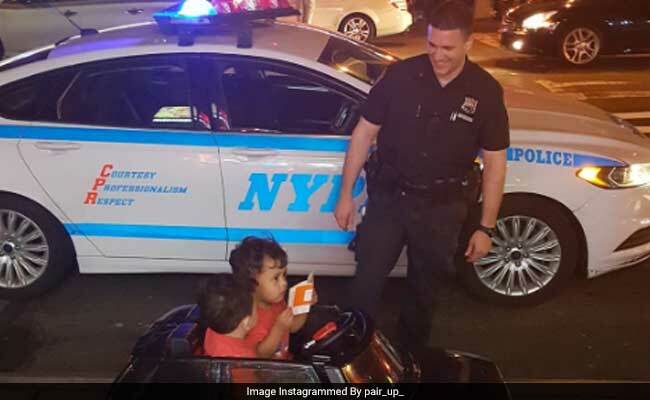 A video, posted by the New York Police Department (NYPD) on their official Facebook page, shows how the adorable toddlers were "pulled over" by amused police officers. Their father explains he was taking his sons out for their routine "drive" around the block in their pint-sized Range Rover when two curious police officers happened to pull over and ask about the car. When Alex asked if they could have a picture together, this is how the officers responded. "They turned the lights on and made the whole big deal like they were going to pull them over," Alex tells InsideEdition.com. "Everybody's like, 'what's going on?' They were stopping traffic, buses." The twins didn't understand what was happening. "They're in total shock, they didn't know what was going on, especially with the lights and everybody looking at them," Alex says. In the video, one of the twins gamely accepts a high-five from the police officer while the other slumps down on the steering wheel - perhaps in embarrassment. Oops. "As everyone in NYC knows, driving on the sidewalk is strictly prohibited, but these two little guys got off with a warning (plus a high-five and two new friends)!" the NYPD captions the video while sharing the clip on Facebook. In less than 24 hours, the clip has been viewed over 292,000 times. It has collected 9,000 reactions and been shared over 2,700 times.